Calendar screen is appeared in Home Page by tapping search icon in the bottom navigation bar. 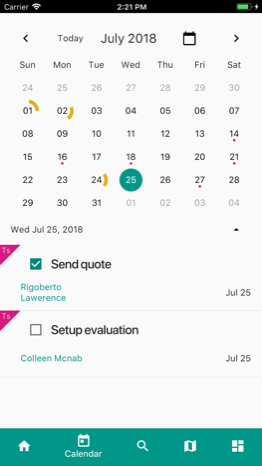 The calendar will show your calls, meetings, and tasks provided you are an invitee on the call or meeting, or the task is assigned to you. You can view one week or one month by toggling the arrow switch . Tap on the day you want to view.